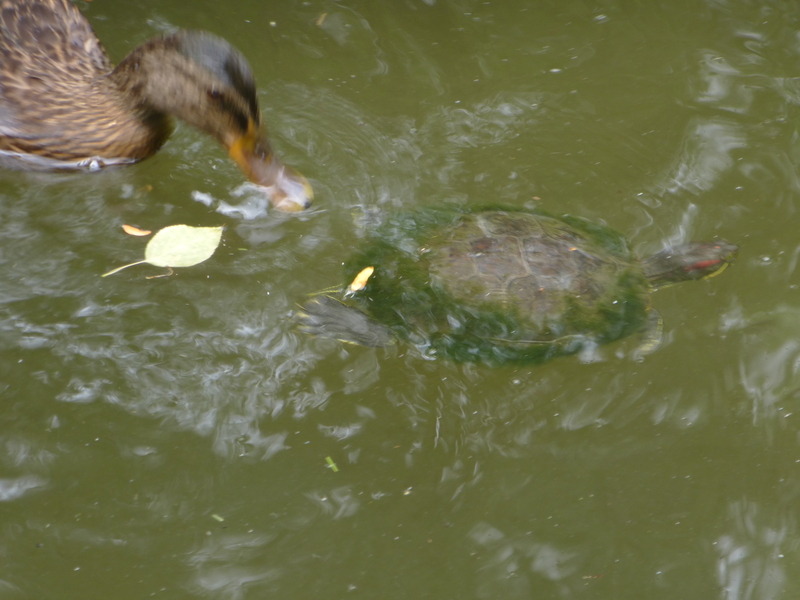 All is going well at Botany Pond: Honey has reduced her aggression towards her timorous daughter Phoebe, and they manage to eat together without much rancor. Honey’s wing feathers continue to grow after her molt, but little Phoebe, though her wings seem large, hasn’t yet flown—at least to my knowledge. Still, this year 7 ducklings have fledged and Phoebe’s next. That makes a total of 11 over two years—all from Her Highness Honey. Here’s a video of Phoebe bathing and flapping her wings. To me the wings look full-sized, but since she seems to have been a bit of a runt, perhaps she has some growing to do. She’s certainly vigorous, though. Two more videos of Phoebe and Honey bathing and preening together. They get along well, though Honey may peck Phoebe a bit during feeding time, or give her the stink-eye. But they’re both eating well and copiously. Preening (oiling of the feathers from a gland near the base of the tail) is mandatory after all meals! Note Honey giving Phoebe a quick peck at about 24 seconds in, which startles Phoebe. Phoebe (right) is still smaller than Honey (left), but the “runt” is plump and sleek-looking, thanks to copious corn and mealworms. Demon ducks! Photographed in the early morning with a flash. This entry was written by whyevolutionistrue and posted on August 10, 2018 at 2:30 pm and filed under ducklings, ducks. Bookmark the permalink. Follow any comments here with the RSS feed for this post. Both comments and trackbacks are currently closed. 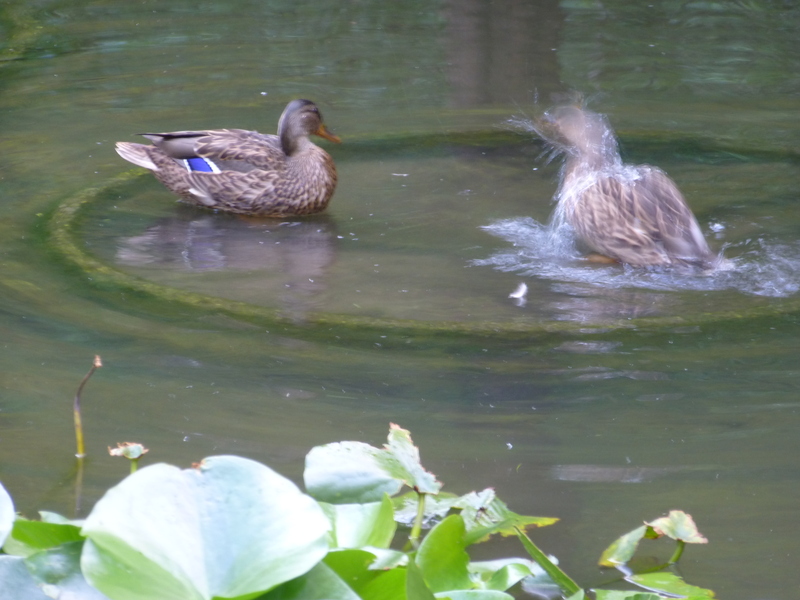 I am curious where the ducks go after leaving Botany Pond. 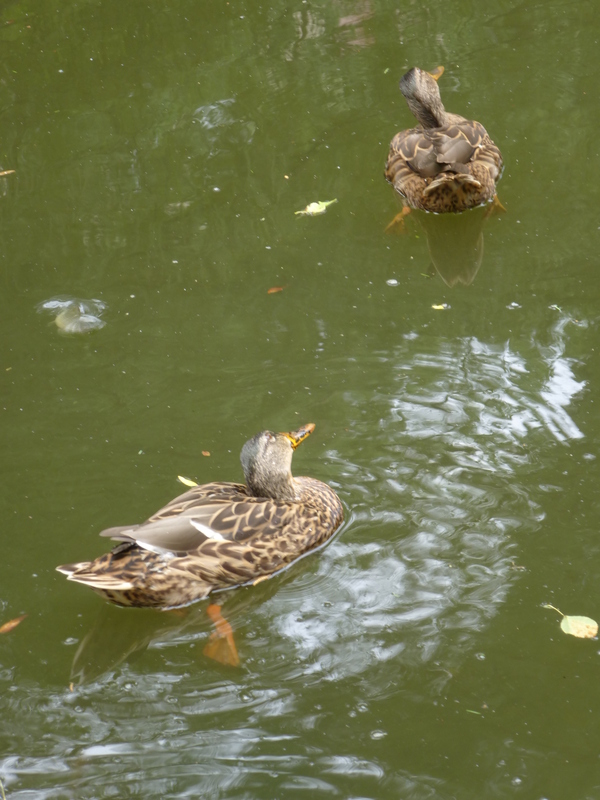 I assume that most fledged ducks stay where they were born until it is time to head south. Is this true? 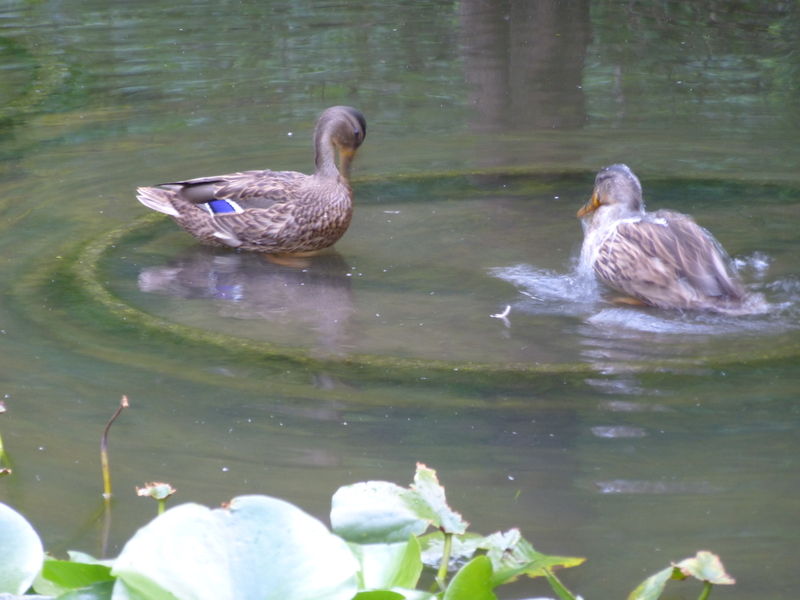 I think the new fledges (and fledgettes – if there is such a word) leave Botany Pond because it is so small. Will they go somewhere nearby and then join the flock when they start their migration south? How far will they travel initially? 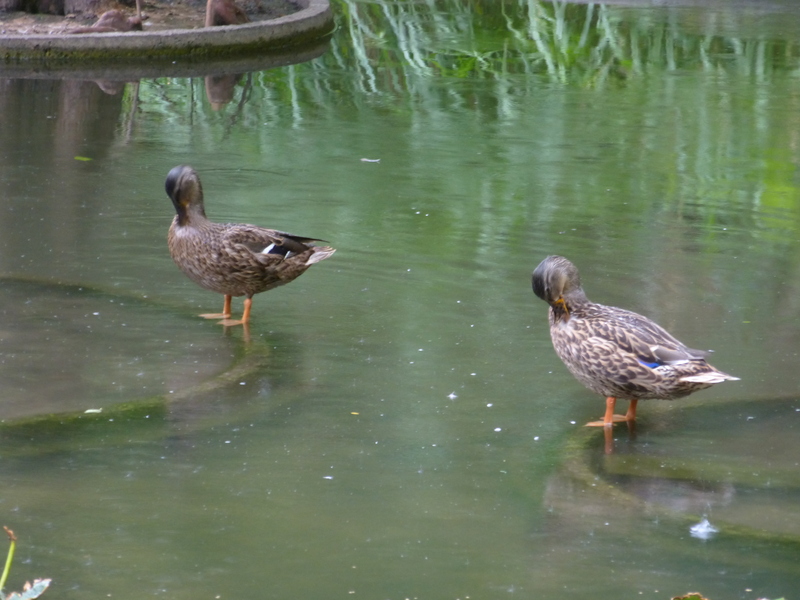 Do ducks begin to gather? I have seen Canada geese do this. At least I think that is what they are doing. I have not been able to find good information on this. We need a resident mallard expert. 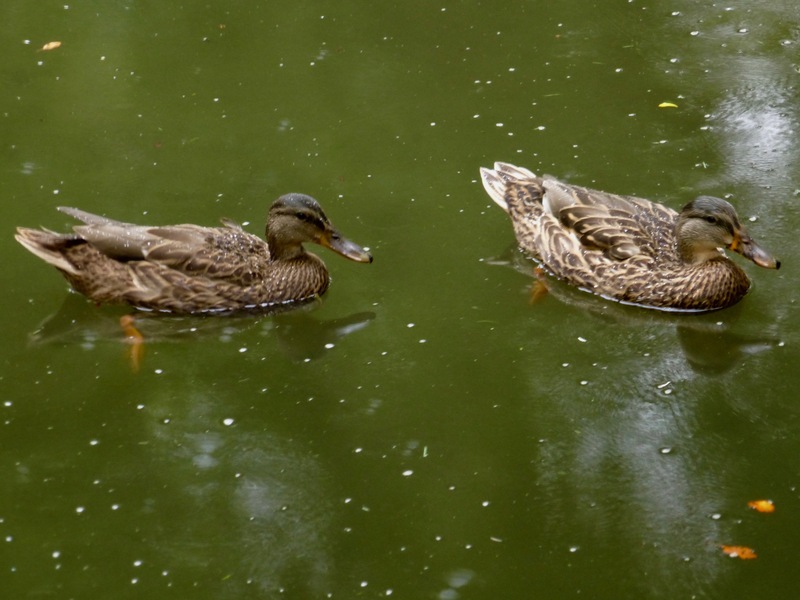 I can’t speak for Chicago Mallards, but generally speaking it isn’t true that all mallards migrate – it seems to depend in the main on the climate – can the locale support ducks all year round? “It is strongly migratory in the northern parts of its breeding range, and winters farther south” to quote Wiki. Here in the UK, mallards may be resident breeders OR migrants – many of the birds that breed in Iceland & northern Europe spend the winter here. In the North Americas the ducks tend to use the wetlands associated with the two major south-flowing rivers to refuel on their north-south & south-north trips. 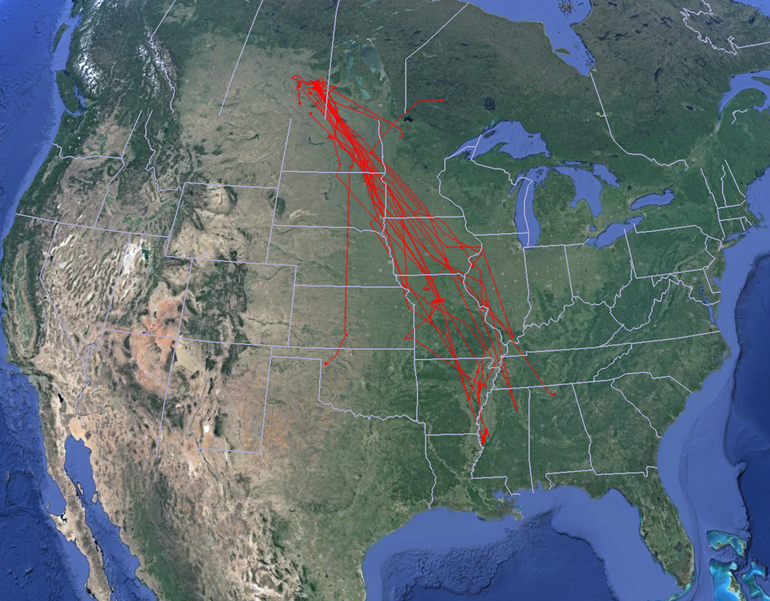 Here’s a great map showing satellite tracked ducks – there’s a lot not known about our duck friends vacationing. 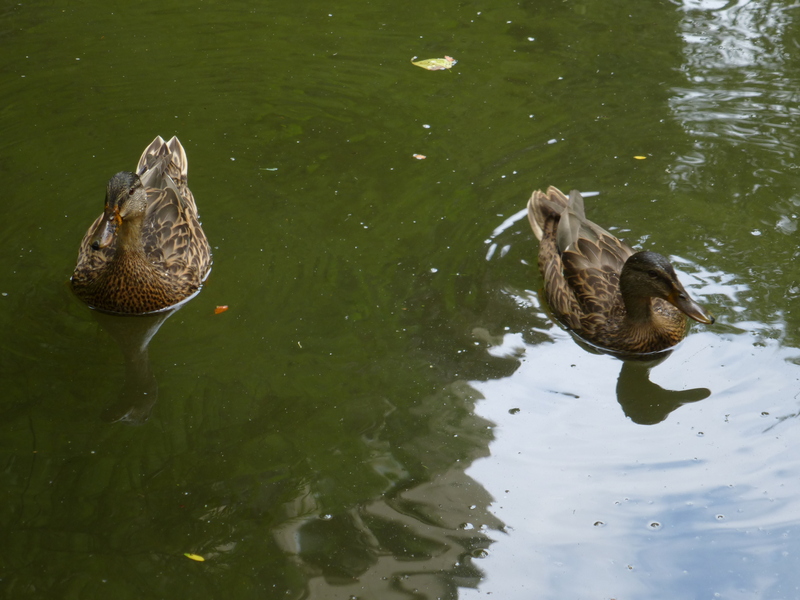 There are no ducks in Botany Pond in the winter. And my memory is that the lagoons in Washington and Jackson Parks are bereft of ducks in the winter. Some ducks probably stay in the larger habitats like Lake Calumet and Wolf Lake (which are about 10 miles south of Botany Pond). My impression is that there are fewer resident ducks than Canada geese – which are everywhere. There is a lot of information about duck migration because of the work of Ducks Unlimited – a hunting organization. Which actually does a lot of good if you can get over that shooting ducks thing. They are a huge and successful advocate for wetland conservation. Also at the state level, DNRs (Department of Natural Resources) also collect a lot of information. My question is very local. 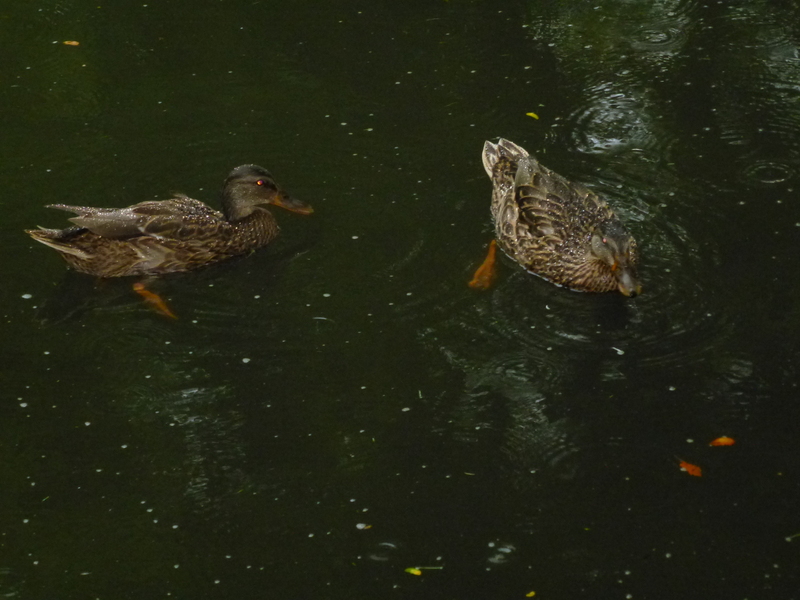 Where do the ex-ducklings go after they are fledged? I think they have to leave Botany Pond because it is so small. So I think they go somewhere there are more ducks. And how do ducks organize themselves for migration? Is any duck welcome to join the flying Vee? There is still over a month (usually end of September) before the migration begins. I know–those are my questions, too, and I have no answers. All I hope is that they are healthy and make it south–and that Honey returns next year. I too have questions because the picture they show with the migration has the ducks going north in the spring for breeding. Yet, many ducks do not breed in Canada, they breed in Chicago and all over Iowa and here in Kansas. We also have lots of Canada Geese and they do not go anywhere. They have their young here and they seem to be what is called local geese. They do not have the instinct to migrate – possibly because they were born here. The only thing that seems to happen with the Canada Geese is, if all the water freezes up, they go south until they find open water. Then they return. I’ll admit, I’m a little worried about Phoebe. She seems quite timid and that is not a quality that will be an asset in the wild. I’ve seen examples in Nature shows — some offspring are simply meek. I wonder if Phoebe will stick by her Mum forever. Mum seems to tolerate her. Of course, this may all change when some males come by and meet Phoebe. That’s good stuff. 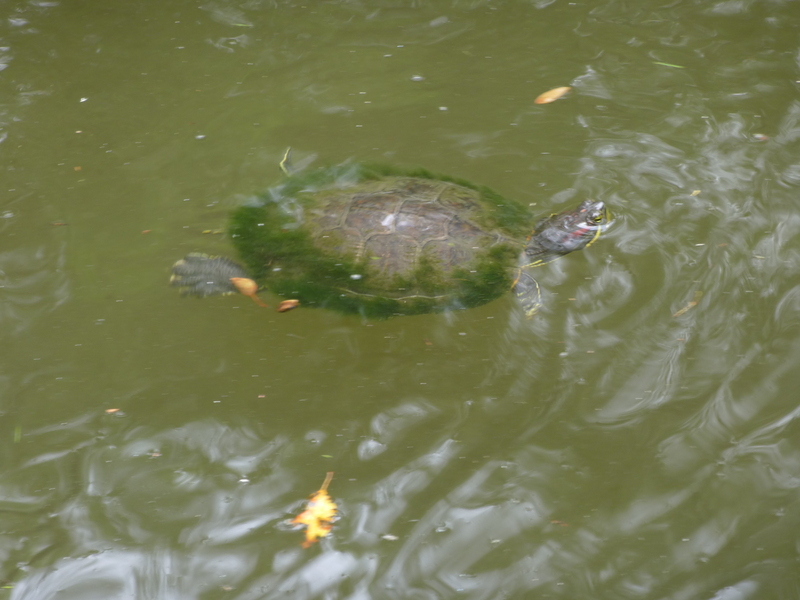 I have never seen the algae on turtles like this. Must be due to the small space and therefore, not much movement. I have algae like this on the turtles in my small (300 gal.) pond. I need a duck! But it doesn’t do any harm and only happens in summer. 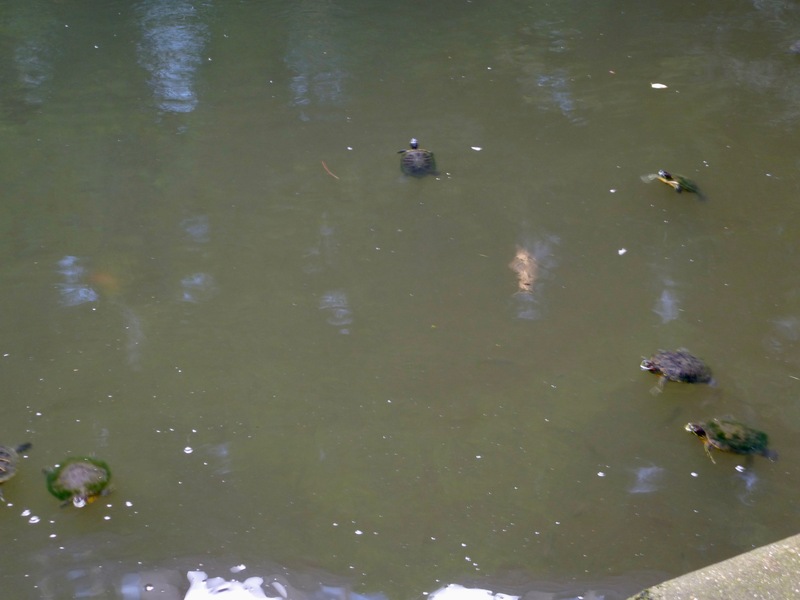 Summer sunlight and high nutrient levels caused by the waste of active turtles, ducks, fish, etc. make it an ideal environment for algae; they also love the warmer water. As you noted, not much movement (not a lot of oxygen entering the water) also exacerbates blooming algae. Botany Pond does have an aerator, which I’m sure helps the fish and such, but it can’t add enough oxygen to offset the algae. It will clear up in winter, when there’s nothing much to see…esp. when it freezes over! Just about all lakes that are shallow are going to have problems with algae and all kinds of plant growth. The fertilizer run off causes much more of this but when the sunlight hits the bottom, everything grows. We were able to stop this on our 25 acre lake because we had a source of water coming into the lake. We turned it full on so that no matter how much it rained all the water came through the lake. You also have to create a way out so no matter how much water is coming in, you are moving it out just as quickly. What this does besides constantly turning over the water, it stirs the bottom and keeps the water brown. It never settles out. Therefore, the sunlight does not go to the bottom and nothing grows. So basically, the answer is, keep the water stirred up and nothing can grown. If you have a lot of growth on a small lake it will ruin the lake. The fish will all die. The algae and other growth will take much of the oxygen out of the water. Fresh water is pumped into Botany Pond throughout the year – including winter. It is regular City of Chicago water – from Lake Michigan. One year, all the koi died because someone shut off the water into the pond. Turtles have buried themselves in the mud for the winter so they were fine. Not so much the fish. If Phoebe doen’t migrate just let me know & you can mail her to me for the winter. If she doesn’t I am going to call Fish and Wildlife to rescue her. If Phoebe is left alone, you should contact your local wildlife biologist with the Illinois Department of Natural Resources. Who is Nicky Strahl (847) 608-3122. Noun. anatidaephobia ~ The fear that one is being constantly watched by a duck! More of a joke word, as I don’t know if people actually have this fear, but it’s still a word. The fear of palindromes is: aibohphobia. I’ve been doing this a lot lately for some reason…this was meant to be a reply to Micael’s comment above. And in my haste to correct my mistake, I misspelled Michael’s name. Sorry about that. Good grief, I’ll go away now.